Opened in 1964, this restaurant and lounge was housed in a noteworthy mid-century style building. The sign outside announced “Food” and “Cocktails”, and then (below the clock) further clarification: “Polynesian Food”. The red-and-tan interior boasted some Witco décor, Tiki masks, faux-tapa designs on paper, lots of bamboo, and hanging floats and lanterns. A 1964 Denver Post review praised the food and the “suffering things” (you can guess which cocktail the reviewer was hesitant to name). Ernie Menehune provided entertainment—when he wasn’t busy is Las Vegas. Ernie still played gigs in Arizona well into his 80’s. Two waitresses (Elizabeth Madrid and Judith Finchum, both 23) were arrested on January 19, 1966, for waiting tables in lingerie, a gimmick that had been used in the Tiki Kai in Albuquerque for some time. Madrid was fined $100; owner Harry Jew said that business had doubled in the single week that the two girls had been working there. A former waitress named Pat tells us: “(in 1966) Harry was the owner, Gordon the manager, Lou the maître D, Linda the hostess, Mike the bartender, Speedy the backup bartender, Tommy Jung the chef. 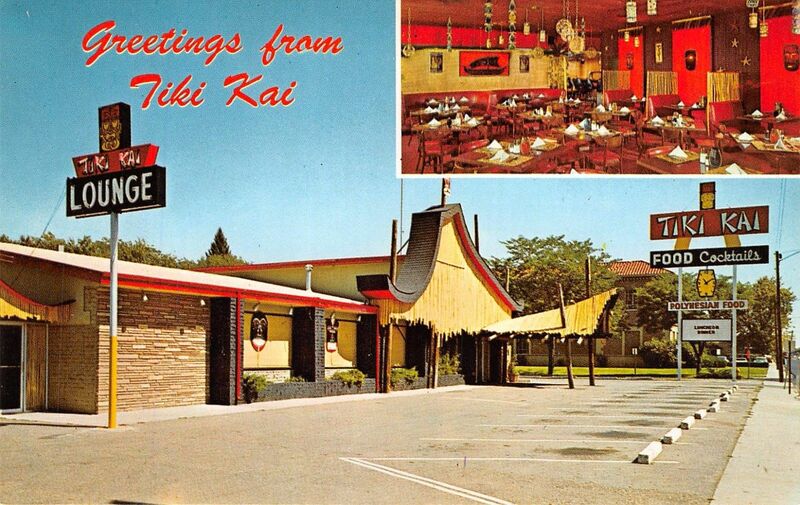 I left Tiki Kai when I married Tommy.” Tiki Kai closed in 1972, became the Islander until 1975, and then the Chinatown Restaurant (which still serve Polynesian drinks in their Kahuna Cocktail Lounge) until being demolished in 1992. From: Tiki Road Trip: A Guide to Tiki Culture in North America, by James Teitelbaum, 2007. ...and now it's a swimming pool. flawed information regarding its last incarnation. what mr. teitelbaum calls the chinatown restaurant was actually herb wong's new china restaurant. he had moved from the original location near colfax and clarkson, where it had been for 20+ years. sometime in the mid-80's, he sold it to jimmy jew, whose prior restaurant was the oriental gardens on 2nd and broadway.